Before we start, we'll admit that we know that we've used an image of the Madras Motor Race Track for this story. That's because even though the story is meant to be about the first race of the MRF Challenge 2015, we also want to talk about the rest of the season. Most importantly the fact that after two more rounds of the championship that will be held abroad - Round 2 at Bahrain (November 18-20, 2015) and Round 3 at the Dubai Autodrome (December 17-19, 2015), the final round of the international series will once again be held in India at the good old MMRT (January 29-31, 2015). Now that we've got that out of the way, let's see what the fourth iteration of the championship has in store for us. Well, to begin with, the famed Yas Marina Circuit makes it to the calendar for the first time, which means it's another F1 grade circuit at which drivers competing in the championship get to race. Then, there's the fact that the second round of the series, held at the Bahrain International Circuit will also be a support race for the season finale of the World Endurance Championship 2015. Onto the drivers then. The grid of drivers for the 2015 edition of the event holds promise. We'll start by saying that we're plenty pleased to see three Indian drivers on the grid. 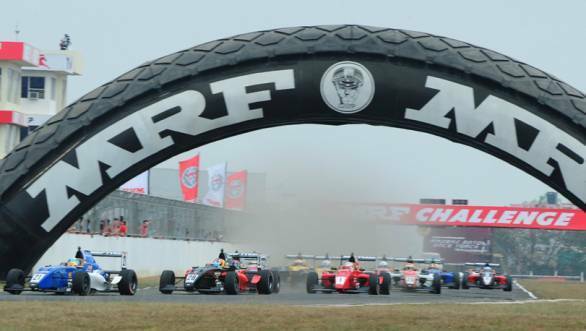 Of course, one is young Tarun Reddy, who won the championship in 2014, while the other two are Karthik Tharani Singh, winner of the MRF F1600 series in India, and Arjun Narendran who finished runner-up to Tharani Singh this year. Joining them on the grid are the likes of Nobuharu Matsuhita, whose experience in GP2 will make him a particularly formidable opponent. Pietro Fittipaldi, Protyre Formula Renault Champion in 2014, and the grandson of double Formula 1 champion Emerson Fittipaldi will also contest this season. Jake Dennis, who finished third in the FIA European F3 championship this year, will also be on the grid. As will Harrison Newey, who competed in the ADAC German F4 championship this year, while his father Adrian Newey of Red Bull fame, battled it out on the pitwall in Formula 1. The series will also feature two women drivers - Alice Powell and Laura Tillett.